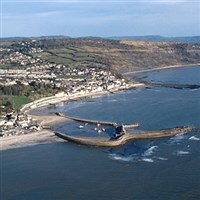 Situated at the heart of the Jurassic Coast, a major centre for fossil collecting, recognised and acclaimed worldwide. Famously depicted in the film version of John Fowles' French Lieutenant's Woman and Jane Austen's Persuasion, the resort's unique appeal wins her a deserved accolade as the Pearl of the Dorset coast - a gem in the Westcountry's holiday playground. More recently, the area has featured as a backdrop for the hit TV series Broadchurch. The area has now been awarded World Heritage Site Status; famous for its geology and fossil finds. Lyme Regis drop off and pick up at the bottom of the hill for passengers to disembark and get back on, then after drop off, driver to go and park in coach park.